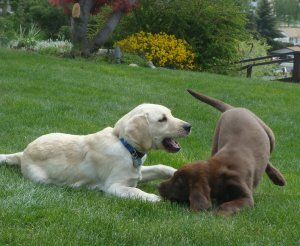 Jasper, our 3 month old chocolate labrador retriever puppy had his first play date today with Harley, a 4.5 month old yellow lab puppy. The dogs ran, frolicked, nipped at each other, played with a rope toy and but for the fact that Harley lost a wisker (I felt SO bad), no one was seriously injured. We owners, Grace (Harley’s mom) and Ed and I could barely contain ourselves for laughing at their puppy antics. Seriously, what could bring one faster back to earth and in the here and now than watching a couple of puppies at play? It was awesome! And here’s another video of the Labrador Puppies with a Rope Toy .